Niche: Helping web designers get more clients. 1. What Joe’s business looked like back in 2014. 2. Joe’s early discomfort with selling over the phone to cold prospects. 3. How Joe got started designing websites. 4. How Joe went from $6,000-$50,000 per month. 5. Why Joe pivoted his business model to scale his business and reduce complexity. 6. The big problem web designers face in today’s market. 7. Joe’s long term goals with his business. Keep going past the point of comfort and the results will roll in. Sam Ovens:	Hey everyone, Sam Ovens here and today I have Joe Kashurba here on with us. Joe is one of my longest term clients that I've got. He's been around pretty much since day one. Back in about 2014 when I had a course called The Consultant Blueprint that basically showed people how to sell websites and digital marketing retainers. Back then, in 2014, Joe joined. At that point he was a freelance website designer. Someone who was good at making high quality websites, that was his craft. He'd get one or two clients a month for that and he'd deliver those projects and give them to them. He was making an average of about $75,000 per year doing that. Then he joined Consulting Blueprint and learned then how to sell digital marketing retainers on the back end of selling websites, which enabled him to introduce a recurring element to his website design business and get more into the marketing side of things instead of just the website. Then fast forward a bit further, Joe realized that he knew now, he had a real good skill. He knew how to get clients for himself, which was for high end website design clients so he decided to transition to selling a training program. Then he created a program that helps website designers get high value clients and charge good prices and get predictable incomes. Sam Ovens:	He's been able to go through all of those stages of evolution and grow to the point where he's making around $50,000 per month. It's an awesome story. The stages Joe's gone through was like, what I call the evolution of a consultant. It's the classic path most people follow. There's a lot to learn here and the stages that Joe has gone through, there's a high chance that you're going to go through those stages as well. Thanks for jumping on Joe and looking forward to diving in. Joe Kashurba:	Absolutely. Thanks so much for having me. Sam Ovens:	Let's go back to 2014 when you joined the Blueprint, what was business like back then? What were you doing? Joe Kashurba:	It was sort of stagnant and I was frustrated. I was doing pretty well, just pretty soon out of college and I was making decent money and charging $4000 or $5000 for websites but I really didn't know what to do. I had no idea how to actually go out and get those clients. It was just like, I'd randomly get a client from a referral or an old client would come back and need a website redesigned. I was really looking for what was I actually going to do to move forward. That's when I saw your Facebook ad. Sam Ovens:	Got it. What did the ad say? Do you remember? Joe Kashurba:	Yeah. The ad was, I think it was the 20 hot consulting niches download. It was just a list of different industries. I remember that was the first one I saw. Sam Ovens:	How would you describe your problem back then? You said you were kind of stagnant, frustrated. Explain it a bit more. What was causing the pain? You're fresh out of college making 75K selling websites, working for yourself. Why was there any form of dissatisfaction? Joe Kashurba:	I think it was that I had a business that I didn't really feel like I had built the business because the only reason I had any of those clients was because I started way back in high school and just back in high school it was people that my parents knew building websites for them and stuff like that. I kept being lucky enough to get some more clients but I had absolutely no idea how to actually go out and get them. There's always this fear of maybe I'm not going to get another client or I just always had this thought that if I were to move, most of my clients were local at that point, if I were to move, I would have no idea how to get another client. It was just, I felt like I wasn't building anything, I hadn't built anything and I was just sort of lucky enough to keep getting these clients. Sam Ovens:	Got it. You were making money but you had a fear that it could all stop because you had no idea or no control about how to control the client acquisition process. Joe Kashurba:	Exactly. I had no control over that, no control over that and no control over getting larger. When I was little I had all these dreams of making all this money and being successful entrepreneur. I felt like I was stuck. I had various startup companies in college that never went anywhere. I almost was doing the freelance web design at that point because that was something that was making some money but it was not something I ever saw I could make a lot of money here. Sam Ovens:	Got it. What interested you in The Consulting Blueprint? Joe Kashurba:	I think I was curious at first and I didn't know exactly what you were offering. I remember watching a video when you were going to talk about the four or five productized services that you sold or something. I didn't know what it was going to be. Then when I heard it was SEO and doing Adwords and things like that for clients, I got really excited because I'd done a little bit of some of those things for web design clients and I realized that this was something that I could do and could be part of my existing business and would work really well. I had Adwords clients where I charged them like, 50 bucks to set up their Adwords campaign. You're on there talking about how I could charge 1500 a month for that. Sam Ovens:	Sorry, this cat is getting up here. It's jumping all over me. Joe Kashurba:	No problem. That's what appealed to me is it seemed like it could work really well with my business. Sam Ovens:	Got it. You joined and then what happened next? Joe Kashurba:	I remember you had a lumpy mail template as part of the product launch, where you were sending out a letter in the mail to people with a magnifying glass. I had bought 500 magnifying glasses before I even bought the program. I was ready to roll. I started going through the program, I started sending out lumpy mail like crazy, hundreds of those. Then I started other marketing strategies like one of the big things I learned was just the idea that I have to be responsible for going out and getting the clients as opposed to hoping that they come. Every morning I would send out lumpy mail, then I set up an Adwords campaign that was running. That ended up running really well and being one of the marketing strategies that worked really well to get web design clients. I tried a couple other things but I just started aggressively going out and marketing, trying to find a way to get clients consistently rather than just hoping. That was just a real, it almost seems obvious. Once you know it, once you realize that if you want clients consistently you have to market consistently, it seems super obvious but it took me 10 years in business to have you give me that realization. Sam Ovens:	Got it. What happened after that? You started doing revenue generating activities every day. Then did that start making an impact on your business? Joe Kashurba:	It was pretty immediate that I started having conversations with people but it took a while, I think one of the things that happened was I realized that in the past I'd only talked to people who were referrals. I thought I knew how to sell but I really didn't because I was only talking to people that were basically ready to buy. There was definitely a period of time where I had a lot of consultations and meetings and nothing was closing. I needed to do a lot of the sort of affirmations around confidence and practice sort of doing sales until I was able to actually get it to work. Eventually some of those meetings started converting and then I started making money. Sam Ovens:	You were used to talking to family friends and warm referrals who you had a lot of connection with. Now, as soon as you started doing lumpy mail and stuff you were talking to total strangers. Joe Kashurba:	Yeah. Exactly. I was talking to total strangers that, in many cases they were curious, they weren't totally ready to go. I was doing all the lumpy mail. I had a cold calling company that was just cold calling thousands and thousands of people and setting up phone calls. I mean, I really went at it pretty aggressively. I was, at that point in time, like you said I was making maybe 75,000 a year. In the first six months of that year, of that next year I probably spent 40 grand on marketing, on cold calling, on lumpy mail, on Adwords, on everything just trying to be as aggressive as possible. But yeah, I was talking to people that weren't as warm as what I was used to. Sam Ovens:	You said you had trouble with that. What do you mean? What would go differently with those cold conversations? How did you malfunction when talking to cold people? Joe Kashurba:	That's a good question. I think the biggest thing that happened would be that I got really uncomfortable and so I tried to sell them immediately. I would get on the phone with somebody that, whether they were set up by the cold calling company or whether they came from lumpy mail, within a five minute conversation I would say, "Yep it sounds like you need SEO, $1500 a month." I really had not diagnosed their problem, I had not really talked to them, they didn't have any idea who I was. I was just- Sam Ovens:	What was going through your mind to do that? Joe Kashurba:	Honestly what was going through my mind was I wanted to get off the phone. Sam Ovens:	Why did you want to get off the phone? Joe Kashurba:	Because I was so uncomfortable. Sam Ovens:	Why were you uncomfortable? Joe Kashurba:	Why was I uncomfortable? I think I was uncomfortable because there's definitely probably some part of me that didn't know that, that wasn't sure that these services, that I was capable of delivering services worth those prices. I think that was a piece of it. I think about piece of it was probably that I'd been rejected a bunch and so I just wanted to get the rejection over with so I could move onto the next one, move onto something else. Sam Ovens:	That's interesting. You didn't have an unwavering belief that what you were selling was the best use of these people's money. Joe Kashurba:	I absolutely did not. That is true. Sam Ovens:	You kind of feel like you're actually doing them a service by selling them in a bad way so they say no. Joe Kashurba:	Yeah, I think there's probably a lot of truth to that. Sam Ovens:	That's very interesting. For people listening, this happens a lot. If you don't truly believe in what you're selling, subconsciously or consciously you're going to know that you're like kind of scamming people and you might not be but you're going to think that you are if you're not comfortable with it. You're going to do things like that to self sabotage. It might not be a completely conscious process. It might be subconscious. Consciously you're like, "I want to make money" but subconsciously, this is going to come in and wreak havoc with you. You've got to sell yourself before you sell anyone else. You've got to make sure your stuff is dialed in before you go out and try, before you go out and start selling total strangers. Did that ever change? Joe Kashurba:	I guess it changed when, I think when it started to change was when I started to get, I had some web design clients that after the website sale, bought Adwords or SEO and I was able to get them really good results. As I actually had some examples of clients that I had gotten results for, I think I started to get more comfortable with the fact that the services were good and that I could deliver good results and that kind of thing. I think that was a big piece of it changing was actually having seen some people be successful. Sam Ovens:	Yeah. That's right. You can't, until you see it happen with your own eyes, you're never going to believe it. You can go to a Tony Robbins event about self confidence and start chanting and stuff but it's still not going to change the fact that you have never seen your services work. You know what I mean? Until you see that, that is the ultimate confidence booster because it's factual. You know what I mean? Joe Kashurba:	Absolutely. Sam Ovens:	That's why that first client is so important. Once you started to see it work for people, you started being, you started getting better on the phone. Joe Kashurba:	Exactly. Once I started seeing it work, it was just the confidence, I think being willing to stay on the phone because I actually knew it would be good for them. Sam Ovens:	How did you get into selling websites in the first place? Joe Kashurba:	That was back in high school. In high school I had a group of friends that had a band. My first entrepreneurial endeavor was the band was playing at this local restaurant and I took my video camera and filmed them playing and sold videotapes of them playing to their parents. That was my first entrepreneurial endeavor. From that I had this idea to do a video production business. For that video production business, I learned how to do HTML to build a website for that business. Nobody ever wanted any video production services but very quickly people started asking for websites. It became apparent that was the thing to pivot to because that's what the need was. Sam Ovens:	It's cool how it happens that way. That's why you need to start because even, that's what I tell people in the group. Even if you pick the wrong niche, it doesn't matter. You'll still find the right one. By you doing that, you found that and by doing that you found that and you found that but none of those discoveries would ever have happened unless you started. Joe Kashurba:	Absolutely. 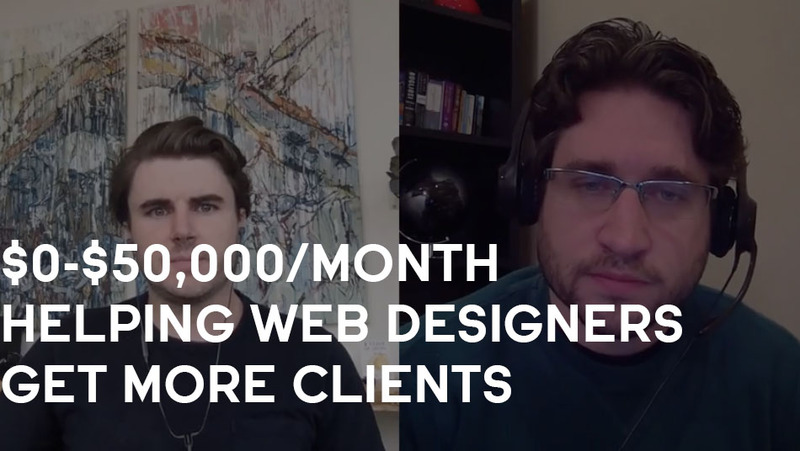 Sam Ovens:	You started doing websites and then you got up to 75K a month. You were getting most of those clients from referrals and then you got stuck- Joe Kashurba:	75K a year. Sam Ovens:	Sorry, 75K a year. Then you got most of those clients through referrals and stuff. You joined the Blueprint to learn how to get clients for yourself. What made you all of a sudden start to think I want to sell digital marketing services to these people? Joe Kashurba:	You mean like the web design clients? Sam Ovens:	Why sell any, why even touch digital marketing services? Why not sell more websites or websites at a higher price? Why add on that other piece? Joe Kashurba:	I think one, I had been really in that sort of couple year period I had been really trying to learn a lot about marketing and going through a lot of courses and different things. I think the thing that I saw was that what these clients needed was digital marketing and SEO. I'd build so many websites for people that they really thought somehow they were going to just get a website and it was going to help their business and it was going to make all this money. That wasn't really the case. There was no traffic going to the website, it wasn't a whole, complete solution to what their problems were. I think the thing I saw was that the website combined with digital marketing and all of that was the best way that I could actually serve them and I could actually solve their real problems. Sam Ovens:	Did you find that a lot of people who came to you wanting a website were kind of under the belief that the website would get them more clients and what they really wanted was more clients? Joe Kashurba:	Absolutely. I think I sold a lot of websites to people thinking this was going to get them more clients or more business. Sam Ovens:	Got it. Then you thought, then you started to see you could build a great website and give them what they wanted but it didn't really give them what they really wanted, which was more clients. Then you saw that there was another component. A good website is important but you really need traffic too. Joe Kashurba:	Exactly. It was exactly that and then I saw that there was those two different pieces. Some people needed both and some people needed one or the other but it was an attempt to actually provide a better service to them because I felt it was incomplete just offering the websites. Sam Ovens:	Got it. What were the services you started selling to them first off? Joe Kashurba:	You mean what digital marketing services? Sam Ovens:	Yeah. Joe Kashurba:	The two were SEO and Google Adwords. Sam Ovens:	Got it. You knew nothing about those at the time? Joe Kashurba:	I knew Adwords I knew a little bit about. I had set up some campaigns but not very successfully or not at a high level. SEO I didn't even know, when I saw your Consulting Blueprint videos I didn't, I thought link building was dead years ago and nobody did that and nobody really did SEO on a monthly basis anymore. I didn't know it really existed more than just the little bit of putting a title tag or a meta description somewhere. I was floored by that. Sam Ovens:	Got it. Tell me how you started selling those things. How did you start introducing them to your clients and how did you start selling them? Joe Kashurba:	To existing clients, one of the things that worked really well for existing clients was, I'd had all these web design clients in the past. I actually put together a short webinar, I called it the state of online marketing in whatever year. I just emailed all my past clients and say, "Hey I'm doing this webinar" on whichever day about what's going on with the internet and online marketing. I just talked a little bit about Adwords and a little bit about SEO and a little bit about a couple of other things and then said, "Hey let me know if you want to talk about this more." I think the first time I did that webinar, actually the first time I did that webinar something got messed up and it didn't even work but the second time, like the webinar software didn't work and it was a whole mess but the second time I did it, I think I got four strategy sessions set up after that webinar with past clients, past web design clients. I either sold two or three Adwords, monthly Adwords retainers to clients from that. That was what I did to upsell old clients, past clients. Sam Ovens:	Got it. How much were you charging for that? Joe Kashurba:	In the Consulting Blueprint, the pricing was 1500. I was doing 1500 or if you just wanted to advertise one thing in one area on Adwords, I was doing 600 a month for that. Sam Ovens:	Got it. Joe Kashurba:	I had a down sell package. Sam Ovens:	How did it affect your business when you started selling the digital marketing retainers on top of the websites? Joe Kashurba:	I mean, it was just night and day because I had started now to have recurring revenue because I used to sometimes I'd have a $10,000 month and then the next month I'd have $2000 because I never knew when I was going to get one of these big projects. Very quickly I got to the point where I had $5000 or $6000 a month in recurring revenue. That was just huge because I knew I always was going to have at least that much. Sam Ovens:	Got it. Then what about the delivery of the services? Were you delivering all of the services? That's like building websites, doing Adwords and if you're doing SEO too, that's a lot of stuff. Joe Kashurba:	The Adwords I did all myself because I could build the landing pages and everything. I was, at that point I was starting to do Adwords myself to get web design clients and starting to see a lot of success with that. I really wanted to learn how to be really good at Adwords. I got a lot out of learning how to do that myself. Then the SEO I found some white label companies that did the link building and everything for that. Sam Ovens:	You learned Adwords and got good at it yourself. You knew how to do website design yourself but the SEO piece you contracted that out to a white label company. Joe Kashurba:	Yeah, exactly. Sam Ovens:	Got it. What were you able to scale your business up to with selling these additional services and with the recurring revenue and also knowing how to get clients? Joe Kashurba:	With all of that and with marketing running like crazy, we got up to the point where we were doing about 50,000 a month between the websites and the digital marketing and everything. Sam Ovens:	Nice. Joe Kashurba:	Probably had 15 to 20 website projects going at once and a bunch of recurring revenue clients and everything like that. Sam Ovens:	You were making about six grand a month before when you were just reliant on referrals, it's kind of like you had your umbilical cord still hooked up. You were just reliant getting fed something down that pipe. Joe Kashurba:	Yep. Sam Ovens:	You couldn't eat for yourself. You know? Then you changed that but you also changed your services. You had recurring revenue, you had more things to sell and you could get the volume in. That totally changed it. What, 50K a month to 6K a month? It's like nine times. Joe Kashurba:	Yeah. Sam Ovens:	Nine times growth. Then, I know at a pivotal moment you changed over to selling a program. Tell me why you wanted, why that even came into your mind. Now you're at 50K a month, you've got a good business, what made you want to change? Joe Kashurba:	I think it was a couple things. Yeah, I mean 50K a month, it was, one thing you said was, actually being able to sort of get clients in myself was key. I remember going from doing one or two leads coming in a month to leads coming in every day, doing appointments every week and everything like that. At that point, that was, things were really sort of busting at the seams at that point. At that point it was me, I had some developers, some designers, I started to bring some project managers in that were managing some individual projects. But it was really, I didn't see much of, I didn't see really how to get to that next level without making something more streamlined. I was going to either have to cut down on the services to try and streamline it more or make some sort of a pivot. That's when, one of the mastermind events at your apartment, we were talking about it. It seemed like a shift to a training model was the way to go. Sam Ovens:	You were bogged down in quite a lot of complexity. Joe Kashurba:	Yeah. It was [inaudible 00:26:36] I had made an enormous amount of progress from originally I was doing everything you could imagine, sometimes hourly, sometimes WordPress, sometimes [inaudible 00:26:51], sometimes custom programming PHP for people to now just doing WordPress websites, just doing Adwords and SEO. It was way simplified down from what it was at one point but still there was a lot of complexity and it was sort of all I could handle with the way the business was set up at that point. Sam Ovens:	Got it. Then when you came to switching to the training model, how did you, what sort of thought process did you go through to think, "I'm going to help web designers get more clients with a training program"? Joe Kashurba:	I think, I'm trying to think. We were there talking about it. I think the question you asked me was, it was something like, if you have to make money tomorrow what would you do. It was some question like that you asked me. We eventually came up with that I would go get a web design client using Adwords or some of the other strategies that had been successful with that. I think that's when it became clear that was a proof of concept that I had put together and something that would be worth putting a training program together around. Sam Ovens:	Got it. I asked you a question that made, to really find what your survival skill is, because that's quite often something you trust in the most, if it's life or death. You know what I mean? Joe Kashurba:	Yeah. Sam Ovens:	It was that for you. Then we thought, well you must be pretty good at it. Is there other people that have that need? Are there website designers out there that want clients? You knew that to be true because you were one. Joe Kashurba:	Yeah, absolutely. Sam Ovens:	Explain that problem about, for people listening because when we go through the training, the first thing we do is pick a niche and we typically pick a niche based on something you have affinity to and interest in. That was website designers for you. Then we identified the problem. You were able to identify it quite quickly because you were one and it was getting clients but explain that problem to the people listening here. How does this problem look for most website designers out there? What's their life like? How does it trouble them? Joe Kashurba:	Yeah. Most web designers, right now they think website builders like Wiks and SquareSpace or basically taking all of the business, many of them think the web design industry is dead and that they think clients just want the cheapest possible website. Most web designers go and try to advertise cheap websites, they say on their website, "We build affordable websites" and "Cheap websites" and things like that. Then they feel like they have to keep lowering their price to get the clients because they don't actually know how to go out and get business so when somebody does randomly call them, they have to do whatever that person wants, charge, be willing to be paid whatever that person's able to pay because who knows when somebody else is going to call them. Then during the project, it's a nightmare because they're afraid to tell the client, if the client wants 10 rounds of revisions on the website design and it takes months and months and they're only paying a small amount for this project, the web designer is afraid to say anything because again, they don't know when somebody else is going to call them. Joe Kashurba:	They're sort of trapped working with quote unquote bottom of the barrel clients that don't want to pay a whole lot, don't want to pay much, demand a lot of service, don't respect their expertise is a big thing, where the client is just sort of telling the person exactly what to do and make that thing pink and put a picture of a cat over there rather than having the web designer, who has his or her expertise actually build a site that's going to be effective. Those are some of the things that web designers are facing and experiencing. Sam Ovens:	Are they, do they get caught in situations where they have a month where they don't get a project and they don't make any money? Joe Kashurba:	Yeah, absolutely. I think most of them, I always had a secret fear that I'd never get another project. Most of the time, a project would appear and that's what people tell me all the time. They never know where another check is going to come from but usually one does show up but they don't have any idea when it's going to come. Sam Ovens:	What do they do in that situation when another one doesn't come, they've got no clients, what would they default to? What kind of behavior? Joe Kashurba:	Doing random services for hire, like maybe some existing client wants them to do a PowerPoint presentation or pay them hourly to put up a Go Fund Me page or just something, random sort of web related work that somebody's willing to pay for. That's best case scenario. The other thing that they might do is just a bunch of random businessy things that actually aren't going to get clients, like redesigning their logo again or posting on something. I think one of the big shifts that I have to help the web designers make is that they have to have some kind of activities that they can do to go out and get business. All these just random things, I'm going to redesign my website or I'm going to post on this random thing aren't going to actually, I'll get more business cards printed. None of those things are going to actually generate any business. Sam Ovens:	Got it. You saw this was a problem, you knew that you knew how to solve it and you were pretty much hitting a ceiling with your Done for You business at 50K a month. You wanted to keep growing so you thought, "All right I'm going to change business models over to the training model instead of the Done for You." How did you make that shift? Now that you conceptualized it, how did you actually execute it? Joe Kashurba:	The first thing I did was I actually just I went straight to, I ran a Facebook ad that went to a scheduling form. It wasn't any kind of a video or download or anything, it was just straight to a scheduling form to talk to me. I got like, 10 calls scheduled almost immediately within a couple days. I basically just talked to those people. I didn't really even try to sell them anything, I just sort of talked to them about that I was thinking about offering some kind of program or something and my experience and what they were facing. I really just talked to them to try to see, I had this idea of what I think other web designers are facing. Is that true? Is this something that would be of interest to them. That was the first thing I did. Sam Ovens:	Got it. What happened? Joe Kashurba:	What happened was I saw one, I was able to run an ad and get a bunch of appointments very easily. I saw two, the people that I talked to seemed to have the very, very similar experience that I had had. Sam Ovens:	Then what happened? Joe Kashurba:	What happened after that? What happened after that? I think there were a few, I put together a few funnels that tried to sell some really cheap programs. I'm not sure why I did that but it was a fail. I think I had a $200 program called Adwords Intensive or something, which was a mistake because I was trying to teach Adwords for 200 bucks as opposed to teaching web designers how to get clients. But eventually, I eventually I got a VSL put together and put together a funnel and actually put together a plan for more of a high ticket program. I started trying to sell it using your sales script and getting appointments set up that way. Sam Ovens:	Let's talk about why you did the $200 program because I never told you to do that. Joe Kashurba:	No. Sam Ovens:	What happened there? It's like a brain glitch. Joe Kashurba:	That's a good question. Why did I do that? I know why it was, because I didn't have to talk to anybody on the phone because the idea was that I could do a webinar and I could send them a sales page with a $200 product and I wouldn't have to talk to anybody. That's I think why I did it. Sam Ovens:	Got it. This thing keeps coming up and getting you every now and again, this fear of talking to people on the phone, it acts as a, you can [inaudible 00:37:17] over it but sometimes it comes back you and bites you and it makes you have a bit of a glitch and do something random. Joe Kashurba:	Yeah. I think part of what was going on was I was back in that situation where I didn't know if my program was going to help people. It was back to that, I'm not sure whether I was selling anything good. I was uncomfortable again. Sam Ovens:	Got it. Then you did that and it worked out that it didn't work. Then you went and did what we told you to do, the high ticket one, the proper program that we're going to sell over the phone with a VSL on how web designers can get clients. How did that go when you started doing that? Joe Kashurba:	I remember it being uncomfortable for the first few calls but I did a handful of calls and then I sold one. Somebody gave me their credit card over the phone and I used the script exactly as it was supposed to be. I sold one. Then I actually had to put together the program because I just sort of outlined it at that point. But yeah, I got the first one within a few calls and I mean, that was, I was floored by that. Sam Ovens:	Then how did the program go in terms of helping the web designers get clients and helping them solve their problem? Joe Kashurba:	Well, I ended up, what I ended up finding was that a lot of them had a lot of problems and things that they need help, needed help with that I didn't realize that they needed help with that and they needed help with things that were not included in the original program. My original program was very focused on here's how to run the ad campaigns and get the clients. I started to see that people, they didn't know how to sell just like I didn't know how to sell. They didn't know how to package and price their services. They were charging $500 for a site that they should be charging 5000 or 10,000 for. They didn't know just sort of basic things about marketing and even basic things about how to build a website that converts. They weren't providing the best possible service for clients. I had to sort of, I built sort of the initial program and then I had to sort of rebuild it with a lot more pieces because I realized there were a lot of things people were missing. Sam Ovens:	Got it. Let's talk about some specific examples. What were some of the most blatant things that people were missing that weren't included in the original program? Joe Kashurba:	Let's see, what would be a good example? One was just having any sort of approach to sales. I mean, people would run an Adwords campaign and people would call them or people would fill out a form to request a quote and I was surprised people wouldn't even return that call until next week and wouldn't return that email. When they did return the email, they'd just send over by email a quote rather than calling them and actually doing a consultation and having a whole sales process. Sam Ovens:	What do you think was going on there in their mind when they did that? Joe Kashurba:	What was going on in their mind? I think it was the thing we talked about earlier, which was they were used to referrals and people that didn't really need to, that would buy. If my mom meets somebody and says, "Hey work with Joe" and I send over a price, they're going to buy because it's a warm situation. I think that's what so many of these web designers had only experienced. That's what they were used to doing. They didn't realize they had to have more of a sales process to it. Sam Ovens:	Got it. They're not used to fighting cold and competing and having to be fast and dialed in and sharp. They're used to just being able to float. Joe Kashurba:	Exactly. I think that's exactly what I saw. Sam Ovens:	Got it. What was another one of their problems? Joe Kashurba:	The other one was the pricing. When I started doing all the marketing, I was already charging probably 4000 or 5000 as a minimum for a website. That's a good amount for a WordPress website. That's the point at which all of the marketing and stuff is profitable and the numbers work and everything. I saw so many people that they were charging $500 for a website or $1000 for a website and there was no way that they could make marketing profitable at those price points. Sam Ovens:	Got it. You helped them, you spotted these problems and then you kind of built a new evolution of your program that kind of plugged these holes that you noticed from the first version. Instead of just showing them how to run Adwords to get appointments, you had to show them how to do the appointments. Then you had to show them also how to set their prices high so that the whole system ran because you couldn't just isolate one part. You needed all the different parts working together to make the whole operate. Joe Kashurba:	Yeah. Exactly. The other specific one was that I saw people that weren't really ready for paid advertising. They didn't have the budget for Adwords and so I had to include in there some of the more organic strategies and things that I used years ago to get a few clients without an advertising budget. Sam Ovens:	Got it. Then what differences did you notice in terms of selling a program versus selling Done for You? Joe Kashurba:	Well, I mean the big difference was it was apparent immediately how scalable it was, that it's a business where everything is so perfectly sort of set up in such a way that you provide support to them on a group call. If everything is housed in the right place, there's not people calling you in the middle of the night and things gone wrong. It was a night and day difference. Sam Ovens:	It was really efficient compared to- Joe Kashurba:	Very efficient, that's a good way to describe it. Sam Ovens:	I remember when I made that system I was like, I figured out how to turn services into a machine because it's still services but it's like a machine, you know what I mean? Joe Kashurba:	Yeah. Sam Ovens:	Then you were able to grow that one, you were able to scale that up to about 50K a month. Now you're on the same level that you were with Done for You. If it's more scalable, why can't you sell more of it? Joe Kashurba:	I think it's a good question. I think there's probably some sort of a mindset thing or a mental block thing or something there that I need to work on. If I look at it tactically, the challenge that we're facing is just getting the ads and getting the funnel dialed in enough that I can just put as much money as I want into marketing to scale it up. Sam Ovens:	We've talked about it before. You have to let go of the other one to have this one fly. Joe Kashurba:	That's where I'm sort of, I'm in both of them right now. Sam Ovens:	For people listening, Joe is in the situation now where he's still holding onto the Done for You. He's still got some Done for You clients because there's good money here. He's also got this working with the program, it's making really good money. This is more scalable but he can't quite let go of this one to let this one blow up. Whenever you're in a situation like this, it's difficult because you've got to let go of this and then go all in on this and until you do that, it never takes off, you know what I mean? I remember when I had to drop my agency. I mean, when Andrew Argue had to, Josh Harris, Matt Kauffman and Victor Elkins, Rob Bailey, dude the list goes on. Go back and just look through these customer interviews. Every one had to drop their agency to let their program fly. We're working on it. Joe Kashurba:	We're working on it. We're working on it. I keep cutting more out, I keep cutting more down. Sam Ovens:	You've got to get rid of the root. Not just the branches, the root. Joe Kashurba:	Yep. Sam Ovens:	What's the future look like for you? What's your big goal? Where do you want to be in one year from now? Five years from now? Joe Kashurba:	One year from now I'd like to sort of finally be in that seven figure range and have just one thing I'm focusing on. I think that would be the biggest thing. Finally get to the point of focus as opposed to being pulled in a few different directions. Sam Ovens:	100 grand a month just selling one program, no Done for You, just focused on that. Joe Kashurba:	Yeah. I think that would be the ideal scenario. Sam Ovens:	What about five years out? Big vision stuff. Joe Kashurba:	Five years out. I honestly don't know. I think that's something I struggle with is not knowing. In my mind I don't want to get to the point of having a physical office and stuff because that sounds like a lot of extroverting but I may change, I may change that opinion when I'm actually in that situation to have that opportunity to do that. I'm really not sure. I honestly don't know. Sam Ovens:	Got it. Then you've been through a few of my different programs since day one. You've gone from 75K a year to 600 grand a year. What would you say has been the one most transformational part of all the work we've done together? Joe Kashurba:	One most transformational part. That's a tough question. I think the single biggest realization was that realization that I am responsible for going out and getting the clients and that whatever business I'm in, whatever I'm doing, I need to have some way to actually go out and get the business like a machine and not just hope for it. I would say that would be the single most important realization. Sam Ovens:	Got it. Then I'm sure you've observed a lot of the students in the customer community, what would your number one piece of advice be for them? Joe Kashurba:	I think that you have to keep going because the results come sort of in a curved, logarithmic kind of fashion where, at the beginning you don't see much and then all of a sudden you get all the results all at once. I mean, I saw it in so many places. I saw it with sales calls where I struggled for so long with them and then all of a sudden it clicked and I became really good at them. I saw that with lumpy mail where I send out lumpy mail and I get nothing and then all of a sudden, I get a bunch of calls. I just saw that in so many places where you just have to keep going, you have to keep going almost past the point of comfort, where you think I'm going at this too long and then just past that point all the results come in, is what I've seen. Sam Ovens:	I think you're a perfect example of that because quite a lot of the time with the things you've done, you've been like, you've taken a while to change the behavior or to confront the problem or to get the results but [inaudible 00:51:18] and at that time it might look like, Joe isn't moving as fast as some of the other people however you never stopped. You've surpassed all the people that were even moving fast but just gave up too quick. You know what I mean? Short term, you don't look like much of a winner but if you look at the longer term, you do win. You could say that's a strength and a weakness but I mean, what matters the most is the long term anyway. I mean, you should try and be able to work faster but you've got the most important trait I think anyone can have in business, which is never giving up because there's a lot of people that come in and have a little miracle month here and a miracle month there but they stopped. They give up and then people pass them. I think that's a really good piece of advice. You've got to just stay with it. If you never give up, it doesn't matter if you're moving a bit slower than someone else, you will get them. Joe Kashurba:	I appreciate that Sam. Sam Ovens:	Cool man. Well, thanks a lot for jumping on and sharing your story. I'm sure it's going to motivate a lot of other people. How can people learn more about you? What if they want a website? You're trying to get out of that so if you do contact Joe about a website and he says he's going to do it, tell me so I can slap him. Joe Kashurba:	I'm probably going to get a bunch of requests now. Sam Ovens:	But if you know someone who is a website designer or a freelance website person and they have trouble getting clients, Joe has got a program that shows people how to do that. How can they find you online? Joe Kashurba:	You can just go to JoeKashurba.com. Sam Ovens:	How do you spell your last name? Joe Kashurba:	K-A-S-H-U-R-B-A. Sam Ovens:	JoeKashurba.com. Joe Kashurba:	Yep. Sam Ovens:	Cool. Well, thanks a lot for sharing your story and I'll speak with you soon. Joe Kashurba:	Sounds good. Thanks for having me Sam.